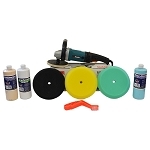 Detail King offers a large variety of Makita rotary buffer kits, ranging in use for the novice detailer to the professional. 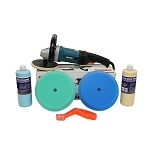 The Makita Buffer Polisher has a variable speed from 600 to 3,000 rpm for super slow buffing to aggressive polishing. The electronic speed control maintains constant speed under load. The lock-on button allows you to use the Makita continuously at one speed. If a random orbital polisher just isn’t cutting it the Makita Buffer will do the job! The 10-amp motor makes the Makita 9237C work tirelessly, no matter how often and aggressively you use it. The 6.5-inch Velcro backing plate accommodates 7-inch and 8-inch pads. The machine weighs only 6.6 pounds so you can work for extended periods without tiring your arms. The Makita 9237C features a large, comfortable handle and a convenient spindle lock in the polisher to make changing pads easy. 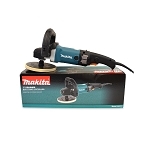 The Makita 9237C is a powerful rotary polisher and should not be used by a novice detailer. 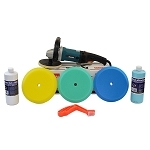 The purpose of rotary polishers is to remove layers of paint or clear coat down to the lowest point of the scratch until it is completely level with the surrounding surface. 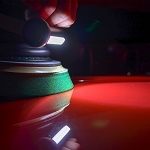 An inexperienced user can easily produce new swirls and burn the paint by holding the polisher in one place too long. 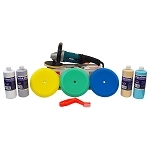 This polisher is for experienced detailers or professionals. 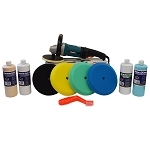 The Makita 9237C polisher comes with a 7-inch blended polishing pad, a 7-inch wool compounding pad, and a nylon tool bag. Also included is a hex wrench that makes removing the back plate easy. 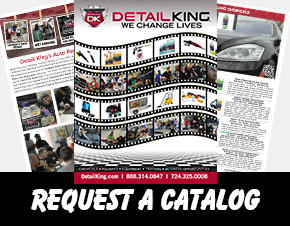 Features: Variable speed (zero to 3,000 rpm) with pre-set maximum speed dial; ideal for ultra slow polishing pre-set speed setting dial (from 600 to 3,000 rpm) for maximum control. Electronic speed control maintains constant speed under load. Easily converts to a sander. There is a three-prong plug to prevent static electricity accumulation. 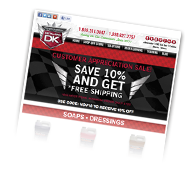 Fast and powerful polishing for clear coat finishes. Lock-on button for continuous use at one speed. 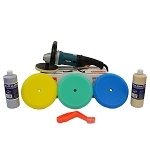 The Makita Buffer Value Packages below feature various polish and buffing pad combinations and will save you money purchasing this way.